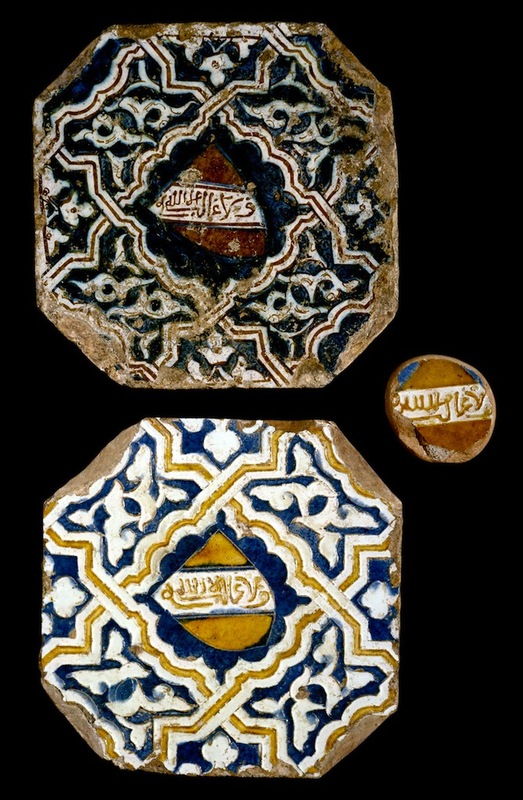 The piece of the Alhambra is a tile that’s been locked away in the British Museum’s collection – or gawped at – since 1802. The museum’s sheer size means you need to walk a million miles for one of its tiles, but found it was, in the dim light of the Enlightenment Room. A hummingbird nest from Captain Cook’s first voyage in 1768 was nearby. The British have always been good at nicking things from other countries but a few tiles from the Alhambra (‘Red Castle’ in Arabic) isn’t quite in the same league as, say, the Elgin Marbles. The scuffed tiles came from the floor of Salón de Comares. The top one was laid during the first installation in 1354 and its more vibrant replacement around 1492, during the palace’s refurbishment. This too was replaced, in 1589, with the tiles in place today. The inscription in the middle says: ‘There is no victor except God’ – the motto of the Nasrid rulers of Spain. The good folk at the museum sent us an image (click for higher res). It was strange to think a piece of glass separated us from an object that was taken from Granada over 200 years ago; a place we’d recently visited, now 1000 miles away. But at least she got a souvenir which was later donated to the museum. 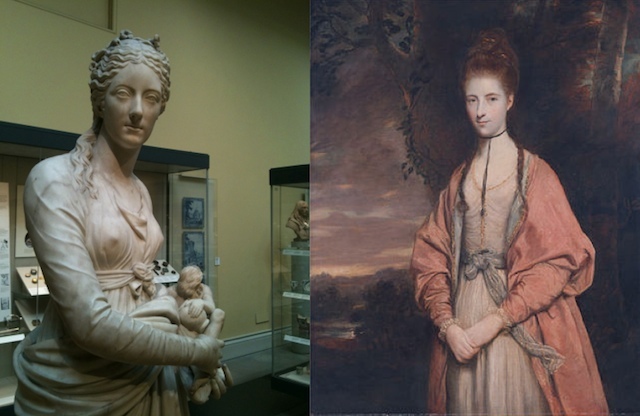 There’s a statue of her in the museum by Giuseppe Ceracchi. He got guillotined in 1801 for shouting: ‘Your father smelled of elderberries’ (or similar) at Napoleon. She was an interesting woman who met both Nelson and Napoleon – and who was the god-daughter of Horace Walpole who bequeathed her a life interest in Strawberry Hill, the bonkers building in west London. She also exhibited work at the Royal Academy in London. There’s little of the Alhambra on display at the British Museum – although there is a piece of window sill from the Peinador de la Reina from around 1362. 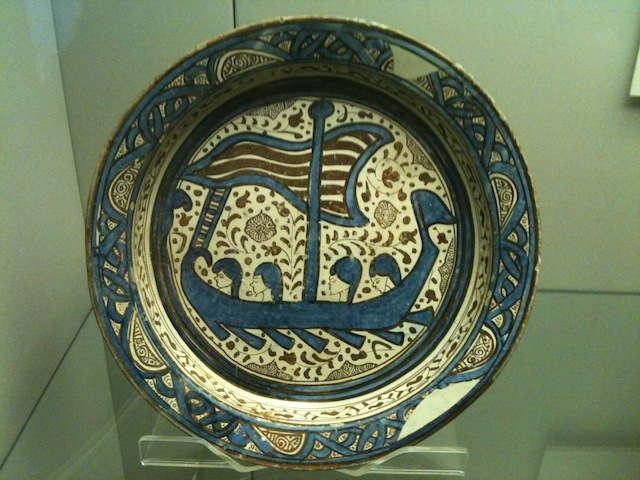 The Islamic world gallery (room 34) also displays various bits of earthenware, mainly painted in cobalt blue – like a flat basin made in Valencia between 1400-1450 showing women in a boat. Thank you. It was fun researching it. They are beautiful. I fell in love with the Alhambra whilst inter-railing as a student. Elderberries smell quite nice, don’t they? Maybe not.